H1N1: to vaccinate and visit the ER–or not? I’ve been struggling with whether or not I should get vaccinated against the swine and seasonal flu’s this year, and also if my dd should get the vax. Even being a paramedic, I’ve always refused the seasonal flu vaccine and continue to be alive. I’m struggling with it this year because while I think the media and government has overhyped the flu (both kinds) to the point where the public is now fearful, I do think about the what if? of it all. If only we knew the future in a situation like this! It’s a difficult situation to determine what to do since I want to be careful about the vaccinations my family receives, but I also want to be careful about the diseases we contract! To help me decide, I did two things: looked in to the non-hype information about H1N1, and called my midwife. As the H1N1 virus continues to spread, health officials and medical experts have advice for people experiencing flu-like illness, who wonder if they should seek medical attention. “We realize that many people are concerned because a new flu virus is circulating along with the seasonal flu this year,” said Marcia Kasprzyk, Deputy Director for Public Health. It may help to know that for most individuals, novel H1N1 influenza will be no worse than the seasonal flu. Call your doctor right away or get emergency care in the event of severe or worsening illness. Swine Flu Signs in adults: rapid breathing, difficulty breathing, pain and/or pressure in the chest or abdomen, bluish skin color, dizziness or confusion, increased fever or persistent vomiting. Swine Flu Signs in children: increased fever, rash, rapid or difficulty breathing, bluish skin color, irritability, not waking up or interacting, and not drinking enough fluids. The New York State Department of Health has set up a hotline (1-800-808-1987) for those who have questions about the H1N1 virus. When I called my midwife, I asked if she’s recommending for pregnant women (identified as being at one of the highest risks of contracting H1N1) to receive the swine flu vaccine. Her answer? DEFINITELY NOT. Instead, she recommends preventative measures such as hand washing. 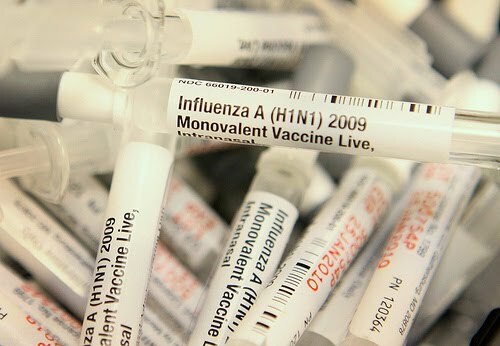 The risks of the vaccine outweigh the risks of contracting the flu–and that goes for both the seasonal and H1N1! What are you plans for flu vaccines this year? To be completely honest: originally I was completely against getting this vaccination as it was so new. Then, I have an offer to get the vaccination for free from the DHEC and I realized how important it is for me to get this vaccination as I am pregnant and work in an elementary school. Then last night it hit me that I have NO clue what the long term effects of this vaccine are. I will regret it when we see a link between the vaccination and something with a large group of children? I will regret it when I get ill because I didn't get the vaccination. I most definantly will NOT be getting the H1N1 OR the regular flu virus vaccine. All three times that I have gotten the basic seasonal flu shot, I have actually contracted the flu because of it, and I really don't want to risk it with the “swine flu” vaccine. It also scares me terribly that so many people are getting it out of fear, and it is a completely new vaccine, so we don't know much about it. Because of the hype and risks, it seems to me that the vaccinations will be made hastily, and given out asap, and that's not neccessarily a good thing. On top of all of that, it is a live virus they are using to vaccinate, isn't it? I don't know much about vaccinations and such, but these things just scare me since they can go both ways. I've been working on a post about this as well… I think this is on the minds of most parents right now. I got a flu shot for the first time ever this year. After a lot of reading and talking to various professionals, we decided it was the best thing to do to protect Baby O, even if indirectly. However, last year, while I was pregnant, you probably would have had to hold me down to get me to get a flu shot. This year, I had them give me the low-preservative one they give pregnant ladies since I'm breastfeeding. Flu shots are new every year, but it's my understanding that they are consistently made in the same way, including the swine flu shot. Therefore, *I* don't think it's entirely accurate to say they haven't had time to be properly tested. That said, we're still on the fence as to whether we'll be getting them for Baby O when he's old enouogh (December). I guess the decision lies with which you feel is the bigger risk. We had the swine flu in September. As soon as the students came back to Cornell and IC, there literally was an epidemic of H1N1 in the city. Of the literal thousands that had it, one student died. One, who had serious health complications besides. We're fine. We were all pretty sick for a week, but never went to the doctor. A couple days after we were at a friend's house for a playdate, Gabe and I became ill. Then my friend emailed me to say she and the baby were sick. She said according to the CDC website, it was all the classic symptoms of H1N1. A couple days later, she called to say they'd been to the DR and tested. It was H1N1. For that reason, I am assuming we had it as well. It was the flu. Nothing incredible. The only thing that stuck out from the flus I've had in years past was the splitting head ache- not the classic head ahce and feverish aching, but a head ache so bad, I could barely lift my head and focus my eyes. Within a week, we were all healthy. I dealt with a bit of residual weakness and fatigue at work for a week after that, but really, nothing incredible. All this is to say, H1N1 is the flu. Like any other flu, people die from it every year. If you are in general good health, and your children are in general good health, I wouldn't bother. Truly, every person who I know who has had the vaccine has subsequently been varying degrees of sick- including small children. I just assume, as with all flu viruses, to take my chances, and just be sure I'm very healthy before being around my immuno-compromised family.